Say hello to the Honor 7A and Honor 7C. They may not be the usual calibre of smartphones that grace the pages here at T3, but these two budget blowers have a few tricks up their sleeves. We grabbed some brief hands-on time with them to find out what they’re all about. First up, there are a number of similarities between the Honor 7A and Honor 7C. Both boast the now-popular 18:9 screen aspect ratio – giving you a taller display which is more often found on phones that cost a lot more than these two. On the front you’ll find an 8MP selfie snapper on the phones, and both have a smart soft light LED, allowing you to grab photos in low light. In fact, Honor says it’s found that most selfies are taken after 8pm, so improved low-light capabilities will be welcome for the selfie-obsessed. Both phones also sport a rear fingerprint scanner, 3,000mAh battery, Android 8 Oreo operating system (with Huawei’s EMUI 8 overlay) 3.5mm headphone jack and, we’re told, both will go on sale before the end of April. The first difference between the two phones are the prices. The Honor 7A will set you back £139.99, while the Honor 7C commands £169.99 due to its slightly larger screen, more power, greater storage and dual rear cameras. The big talking point here, though, is both handset’s face unlock abilities. Made popular by Face ID on the iPhone X, many Android manufacturers are now using the face scanning biometric tech on their phones, too – but the Honor 7A and 7C are two of the cheapest handsets to offer it. Not only is Honor offering this flagship-worthy feature on the phones, it’s also claiming that it works faster than Face ID on the iPhone X – a phone that costs almost six times as much. In fact, Honor says its face unlock tech can detect your face and get you to the homescreen in under a second, and on the Honor 7C we tried it on we’re inclined to agree. It is rapid. Face unlock won’t be available from day one, though, as Honor says it’ll arrive via an over-the-air update sometime in May. Honor has added some extra software features, too, with a gaming mode keeping notifications at bay so not to get in the way of the action, while karaoke mode lets you sing your heart out to your favourite tunes with the phone relaying your vocals. You can even pair up to nine of the handsets together in party mode, allowing you to play the same song though all the speakers for added volume at your next Catalina Wine Mixer. Taking a closer look at the Honor 7C, and seeing it face down on the table, it looks smart, with the dual rear cameras suggesting that it is perhaps a more expensive device than it actually is. Instead, this is the most affordable dual camera smartphone on the market, and picking up the phone you’ll notice it doesn’t have the same premium appeal as even some slightly more expensive budget handsets such as the Moto G5S. While it has a metal rear plate, it’s thin and sits on a plastic frame which runs round the circumference of the device, letting your palm know that you’ve not grabbed yourself a top-tier phone. 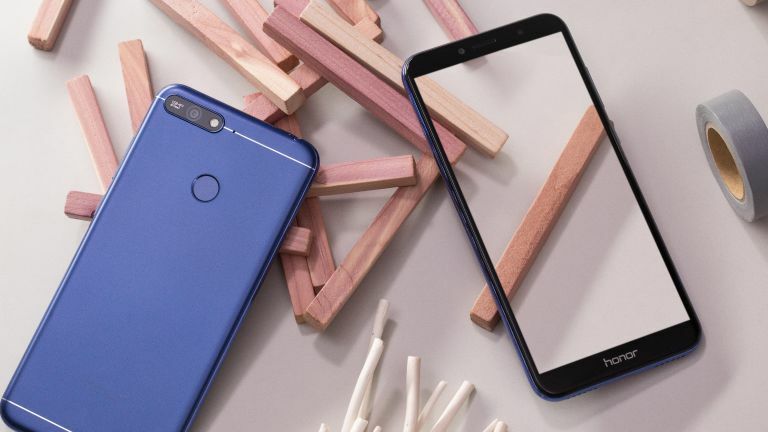 It’s good to see a big, 5.99-inch display on the Honor 7C, and it’s bright and colorful, although the 720p resolution means things aren’t as pin sharp – which is noticeable during video playback and gaming if you look closely. The dual rear cameras on the back of the phone are 13MP and 2MP, with the latter in charge of depth-sensing for the Bokeh mode that’s included. Bokeh mode is basically what Apple’s Portrait mode is on iPhone, blurring the background of shots while keeping your foreground subject in focus. We found the Honor 7C does a serviceable job when shooting in Bokeh mode, and the camera performance overall is okay. It won’t blow you away, though. Inside, you’re looking at a Snapdragon 450 chipset, 3GB of RAM and 32GB of storage, which can be built upon via the microSD card space in the SIM tray. The Honor 7A is all plastic, reinforcing its entry-level credentials, but it also means it’s lightweight and easy to hold in one hand. Its screen is a touch smaller at 5.7 inches, but with the same 1440 x 720 resolution. Again, on close inspection you can see that it’s not as pin sharp as full HD offerings on slightly more expensive low-cost phones, but it’s still a good screen. On the back there’s a single 13MP camera which, during our brief time with the phone, took acceptable photos but you probably shouldn’t expect too much from it. Under the hood the 7A comes with a lesser chipset in the Snapdragon 430, which is paired with 2GB of RAM, while 16GB of storage is also on offer. Oh, and one last thing these two phones have in common: they’ll both be available in black and blue.